Upright or spreading evergreen shrub to 4m tall (usually shorter) with glossy ovate leaves up to 5cm long with finely toothed margins. Produces clustered pink urn-shaped flowers 1cm wide in midspring to late summer followed by small spherical black edible berries that are popular with birds, wildlife, and people. Provides food and shelter for birds and butterflies. May be leggy in deep shade. Can be grown in containers. Lore has the berries becoming sweeter after the first frost. For maximum freshness, please keep seed refrigerated in its original packaging until it is time to plant. Sow seed in containers in a cold frame in autumn. 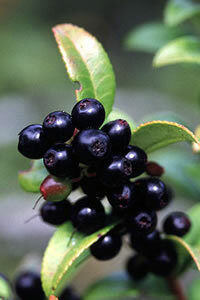 Grow in acidic, peaty moist but well-drained soil in full sun or part shade.